There is one line of dialogue by Anne, where she says, "Yay, scary toy clown". There is no toy clown found in the retail or beta versions of the game. What was the purpose for this dialogue, and what was the setting for this toy clown to have been? 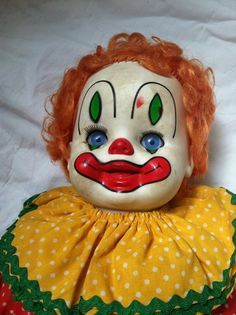 I really really wanted a toy clown to show up somewhere random in the game, just to make you wonder how it got there and why it was left behind in the evacuation. I can't quite remember why it didn't happen. Life has its disappointments! He even later on adds, almost jokingly, that out of things missing from his vision of Trespasser, he is "still a little bitter about that clown." I of course do not posses the skills to make this happen. But I know plenty of you guys do! 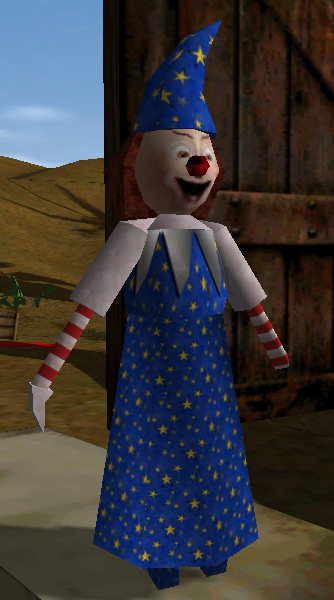 I think we should fulfill Grossman's simple desire of having a scary toy clown model in the game! Who wants to take a crack at it? Given my contact with Grossman, I can promise you that he WILL see the result! Here are some inspirational pictures. I am thinking it should just look creepy rather than flat-out over-the-top horrific. WARNING: Anyone actually afraid of clowns should leave. Like right now. Hidden in the spoiler. 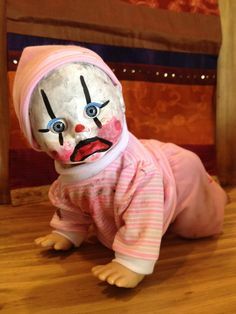 Funny that you should ask for this; I was going to make a "scary toy clown" for another project, and I have already made a Teddy Bear for the line "Must've been the little girl's...". My modelling skills - especially humanoid models - aren't fantastic, but I could take a shot at it if you like? It would be very low-poly in the style of Trespasser, less detailed than others might be able to achieve, but hopefully it would fit in with the vanilla Tres style. If I was going to make it, I would probably base it off of the one from Poltergeist (the first two images) because it was another Spielberg film and doesn't seem deliberately creepy. Having a phobia of clowns, it shouldn't be too hard for me to come up with something really disturbing. Whoa Scallenger, how did you get so many of my family photos? This is a great idea! wish I could model! Okay! Give it a shot! Change it up a little bit though so it isn't a direct copy, but yeah, do it! Anyone else is still welcome to try, too! I want clowns everywhere! 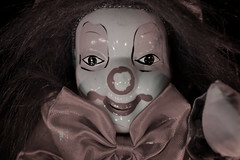 Well, here he is: similar but not a copy of the Poltergeist clown. I gave him a robe and played with the face a little to differentiate him, though the face is mostly based on the said film. If there are any things you would like me to change, feel free to ask! You're also welcome to modify him if you want. Oh, and a last note, the textures are in 24-bit format so you can convert them to your own palette. The image in-game has misaligned textures because I was too lazy to convert the bitmaps; they'll be fine when indexed. Anyone can use it, so long as they give me credit. I'm interested to see what you have in mind for him, Scallenger. Hmmm... I wonder what happens if I rig it to a bipedal skeleton. I like it! However, if I could recommend a couple things? Maybe make his grin a bit more... creepy. Maybe a bit more thin and bigger? Not sure. And perhaps it should look a bit soiled, like it has been left behind and been there a while. No problem, I wanted to redo the face anyway. As for the wear&tear, most of the textures are already dirtied a bit; I tried to keep the levels a bit cleaner, but yellowed in some places - in case you didn't notice, he's actually missing a hand as well to make it look perhaps chewed-on or torn. I can increase the dirtyness if you want though. I'll get on those changes when I get some spare time! I really like the idea of making that clown. Would be awesome to see it in a level. Keep up the good work! Yeah try to see what happens when you dirty him up a bit more. Oh and do notice the missing hand now! But yeah, the biggest thing to enhance is the face, which you said you'll get working on when you have time anyway. Can't wait to see the finished product! Looks a little like a wizard to me? 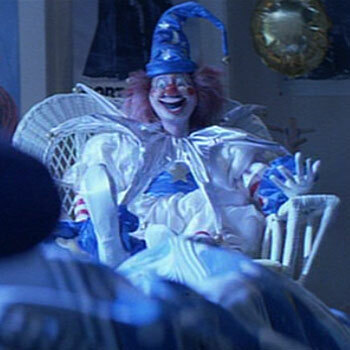 A little bit, but that's the kind of clothing pattern the toy clown in Poltergeist has, which he is modeling it after. But maybe some extra additions to the model could make it look less like a wizard. Sorry for the delay, Scallenger, been pretty sidetracked for the past while. I should get some time to finish this soon - don't worry! Thanks! I'm hoping Scallenger will be including it in a level - I know I probably will. Indeed, I noticed that as well. It probably comes from adding a robe, which the original design didn't have. I could remove it, but then I feel like it would be too close to the Poltergiest clown. Perhaps I could do something different with the hat...maybe make it a jester design instead (not sure how well I could do that with my skills, though)? Or have it split down the middle like the Harley Quinn outfit? Any further progress with this?